Between 1978 and 2004, the American photographer Susan Meiselas made three extended visits to Nicaragua. Time-stamped, they are like hinges of a play. In Act I, which spans roughly a year, Meiselas works as a photojournalist, covering the Sandinistas’ extraordinary guerrilla insurrection, which topples Anastasio Somoza Debayle, the last in the lineage of US-backed dictators. She compiles about 70 photos from this trip into a book, Nicaragua: June 1978–July 1979. Act II opens with the Sandinistas’ first election loss, which her friend Alma Guillermoprieto describes in The New Yorker as “a plebiscite on the Sandinista regime.” With a small film crew, Meiselas returns to the country. She seeks out her book’s protagonists, shows them the old photos, and solicits their responses. These moving and painful reflections are woven into a documentary, Pictures From a Revolution (1991). The closing act, dated 2004, marks the insurrection’s 25th anniversary. 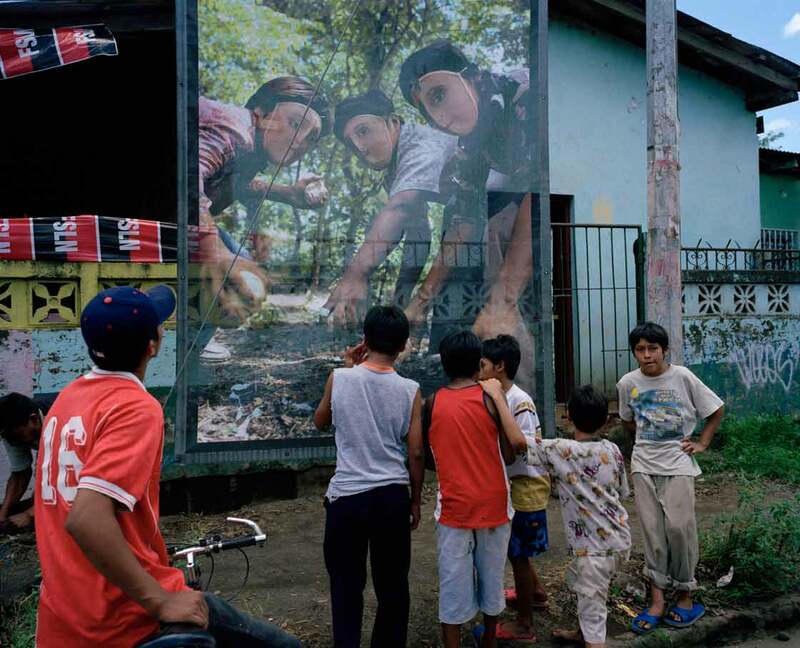 Meiselas travels back with large murals of her images, which she erects, with help from the local Institute of History, in the places they were originally shot. Time, in this play, unfolds at two rates. There is chronos, linear time, events piling up one after the other, pitilessly discrediting a people’s revolution then leveling all notion of progress. (The Sandinista front, or what was left of it, returned to power in 2006, yet Nicaragua remains one of the poorest and most unequal countries in Latin America; 10 percent of its population earns nearly 40 percent of its national income, while almost two-thirds of the rural population subsists on less than two dollars a day.) There is also a nonlinear and redemptive time, what the Greeks called kairos, in which certain moments, or traces of those moments, are preserved, through photographs. When, in 1991, and again in 2004, Meiselas brought her original photographs back to Nicaragua, she was resisting linear time. “The witness has always to protect memory from erasure,” she writes in her new photo-memoir, On the Frontline. “Time and the world’s attention move on.” As a witness, she may protect memory, but only the people she photographed can renew it. This is why, in ’91, Meiselas interviewed her original subjects; their words, in turn, layered her images with new meaning. In 2004, she photographed passersby responding to her murals, provoking, or giving shape to, “postmemory,” theorist Marianne Hirsch’s term for the relationship of the second generation to powerful, often traumatic, experiences that preceded their births. “I especially wanted to know how they spoke to the next generation who had only heard about their history and not participated in it,” Meiselas writes. The play, inexorably, moves forward. Yet the photographs, in different ways, lead us back to its origin. In On the Frontline, Meiselas returns to the beginning of her career to reflect on all she’s remembered, and why it’s worth remembering. Susan Meiselas was born in 1948 into a middle-class family in Baltimore. She didn’t grow up aspiring to be an artist. There was no yearning, no desperation, no hurt ego; no BFA or MFA. Very sensibly, she studied education as an undergraduate, and after that enrolled in Harvard’s Visual Education MA (a teachers’ training program). While there, she received some instruction in photography, almost by chance. These details can be found in In History, a thick and beautifully produced book of photographs, interviews, and scholarly essays that commemorated Meiselas’s 2008 retrospective at the International Center for Photography in New York. They are mostly absent from On the Frontline, which is a far less personal account. Divided into brief sections, each relating to one project, Frontline is less a memoir than a professional, even a political, self-reckoning. It begins bluntly—“From the outset, the idea of a narrative that extended beyond a single frame lay at the heart of my work”—and that no-nonsense voice doesn’t ever let up. It is a strange note for this war photographer to hold, what with all her bravery and suffering. But then Meiselas has always approached her medium from a selfless and analytical perspective (though not in that high-concept Allan Sekula sense). At Harvard, her training was grounded in theory, which seems to have left a mark on her. We might say that she thinks with her camera, or alternately, that she perceives through photography. (Academics, by the way, have picked up on this. Unlike most of her Magnum colleagues, Meiselas receives a lot of theoretical attention.) This investigative spirit animates even her first project, “44 Irving St,” a suite of staged portraits set at her boardinghouse. The “Irving St” series was an instructive experience for Meiselas: It made her confront her own presence in the making of a photograph. Her subjects (her neighbors) return the camera’s gaze or look tellingly away. In either case, they know she’s looking; their awareness makes the shot. “I wanted to place myself in the boarding house because I lived there and was present. At the same time I felt invisible. That invisibility creates a tension throughout my work,” she writes. “I am present, but want to avoid the focus on myself.” “44 Irving St” also established another precedent. After showing them their images, Meiselas asked her neighbors for written responses. Their notes, which are by turns banal, quirky, and startling (“I am divorced. The picture speaks for itself”), were then hung beside the photographs at a small exhibition. “This was the central space of collaboration, along with an act of reciprocation, that I was trying to discover right from the beginning,” she writes. The performance itself, which she describes as “the center of that world,” is studied from opposite viewpoints. In the first case, Meiselas stands amid the spectators, dressed like a man, discreetly approximating their perspective. In the second, she spies the crowd through the backstage curtains, as a reflexive study in voyeurism. One such photograph, from 1974, at a stop in Tunbridge, Vermont, is a tableau of lurid enchantment. A bearded man, cigarette hanging from his lips, holds a wide-eyed boy up to the stage (as if to be blessed by a passing notable); behind them a man, who looks to be in his 20s, smiles creepily. Another boy, maybe a teenager, is wearing a bandanna and gawks at a stripper out of the frame; still another, in nerdy glasses, beams at the little kid. I was drawn to know what motivated them. Partly, but not wholly, their reasons were economic. Yet they revealed other aspects of what it meant to be a woman and to have to use their body in that way. They were not in control, or not as much as they thought they were. They were on the edge where the tease tested them. They were pushing and asking, “How far can I go?” These were not just nudes, but real women with personal histories. There are no obvious thematic links between Carnival and Meiselas’s next major project, Nicaragua. Her career-defining trips seem to have been made with little forethought. “When I read about the assassination of [the opposition leader] Pedro Joaquín Chamorro,” she writes, “I had no idea where Nicaragua was on the map.” She was just struck, as only an American could be, by the romantic idea of “a society mobilizing to defeat a dictator.” Straight away she flew to Managua. “I had no idea where I was going to go, or what I was about to do,” she writes. Then one day she stumbled on a corpse, half-devoured by vultures, by a hillside. This moment brought home the reality of words like “repression” and “disappearance,” which until then, mouthed by Western journalists, had felt abstract to her. The resulting photo is one of the century’s iconic images. It could illustrate the case report when an American president or CIA chief is finally tried at The Hague for his country’s human-rights abuses during the Cold War. The crucial point here is that Meiselas does not know, beforehand, the meaning or significance of what she’s shooting. She only knows that it is significant. (In a telling passage, she describes processing photos in her hotel “in order to see what I was doing.”) This mixture of helplessness and alertness is palpable in her photographs. Frontline, for example, includes an image, from June 1978, of a student demonstration being broken up by tear gas. There is nothing didactic or obvious about this photo. It tells you little about the particular event. Shot at night, lit only by a blurred tube light, it shows two people—one a young boy, the other a middle-aged man, neither of them students—running away from an unseen enemy. The image’s raw confusion holds our attention. It is the first frame of a story that’s probably terrible. Put another way, it is the opposite of a news photograph, which, in illustrating a journalist’s position, essentially amounts to a visual “take.” Photojournalists go abroad to bring back the news; Meiselas went abroad to confront her ignorance. In time, she was enlisted by the Sandinistas as an in-house propagandist. (Alas, she does not narrate the story of how and why they approached her.) A famous photo, also from June 1978, for example, shows three young Monimbo Indians, in dated masks, crouching before the camera, with DIY contact bombs in their hands. “I had never seen people taking a risk before,” Meiselas writes. “If you see the kids first, and then you see them in relationship to airplanes and bombing, then their photographs take on a very different dimension.” Her defensive tone is misleading. Something of the “different dimension” has come through. The image, which should be scary and macho, is in fact about vulnerability. The masks, far from making the affair a “fashion parade,” as Meiselas says some critics accused, only add to this impression. This vulnerability, which is rooted in conviction, suffuses the tremendously quiet images of battle that follow. 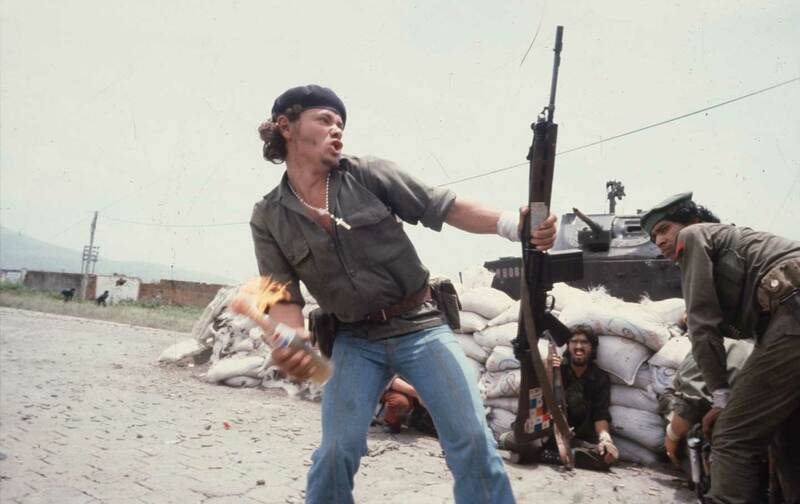 Those included in Frontline show scrawny young fighters in various poses of concentration: looking at an out-of-frame barricade; at their guns; and, in a particularly famous photo, throwing a Molotov cocktail. None of these photos is primarily about violence or combat. Their subject is, simply, action. Each depicts someone taking an active choice, either physical or mental. If the corpse showed history subjecting itself on a people, then the insurrection depicts history subjected to the people’s will. Crucially, the Nicaragua series doesn’t depict what the actions result in or amount to. Alive and open-ended, it shows people forever in movement, reaching for a goal that’s outside the frame. (Most war photography, by contrast, is all about what has decisively happened: dead bodies, exploded houses, planted flags, exploded oil rigs.) That limited focus, an indifference to the future, is what protects Meiselas’s images, and the encounters they record, from history. Operating in kairos, they are transformed into prophecies, pointing, eternally, at a world to come. Her interest soon widened to include the community’s history. Working in Latin America, during the Cold War’s darkest years, Meiselas saw firsthand how the experience, and sometimes the existence, of entire generations could be erased from the record. In this context, she came to see how the photos could form a sort of people’s chronicle that went past the official account. …in retrospect what their struggle meant and what the consequences had been. I had traced the life of many of the images I had made, but what did the pictures mean to their subjects?